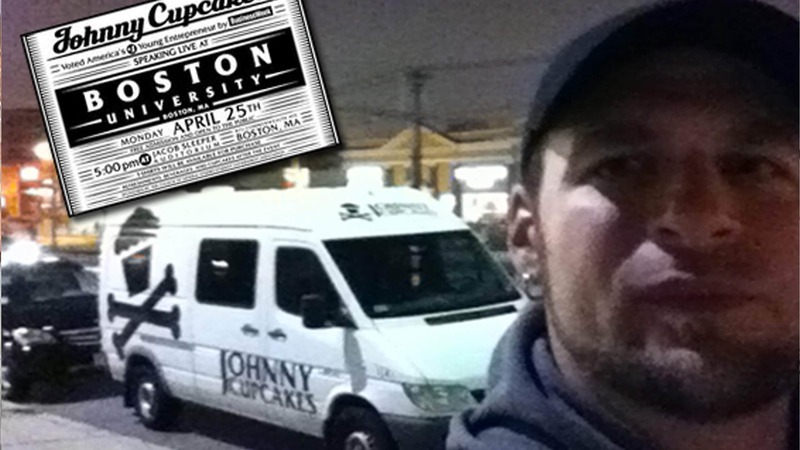 Checked out Johnny Earle tonight at BU for the Johnny Cupcakes Lecture Series. Johnny told the audience the story of how he turned a simple joke into a multi-million dollar business using nontraditional methods. Johnny’s entrepreneurial creativity propelled him from his early high school days as candy slinging salesman to the owner a nationally recognized, multi-million dollar apparel brand. It is super-inspiring to see a locally owned – family & friend operated business succeed on such a global scale. JC’s authenticity & strong community of fans is what the big brands all strive for but really have no idea how to achieve. In addition to a great Q&A session after the lecture, Johnny suggested the best is yet to come. With a book that is in the works, two new top secret businesses and loads of great new products and collaborations for Johnny Cupcakes. I can’t wait to see what Next! For More info on check Johnny Cupcakes Site and this article from Erin Thibeau BU.